Why do people make doomsday predictions based on astronomical phenomena? Doomsday predictions, in which the world ends in some sort of giant catastrophe, have been made periodically since ancient times. Since the universe encompasses Earth, it’s easier to imagine that such a destructive event would come from the cosmos rather than from something purely human in origin. So many such predictions have come and gone over the years that imaginative, unscientific scenarios—many of which have inspired books and movies as well as scientific-sounding rumors—have no real credibility in the modern world. Astronomers, by scientifically studying the universe and how it works, can provide testable, legitimate ideas of any real cosmic threats to Earth. 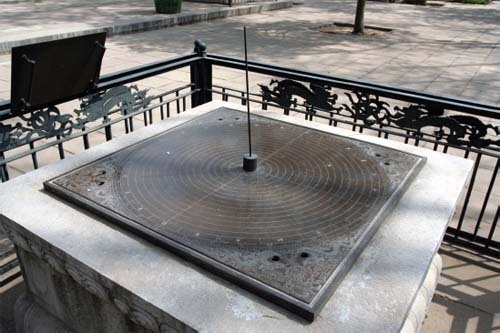 An ancient astronomical dial is on display in China. Chinese astronomers were studying the night skies as early as 1500 B.C.E.